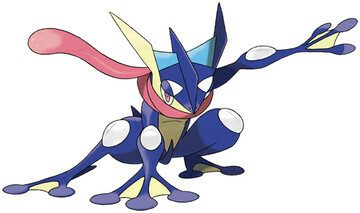 Is Greninja's scarf its tongue? in poke amie if you feed it pokepuffs it opens its mouth but it does not seem to be connected. I just can't tell if it is connected or not. Suit it whatever you want, there's a picture - mouth open - say what you please. answered Oct 28, 2013 by !'•-Indigo-•'! I mean, it is pink and long and frogs tend to have long tongues. It's 99.99% certain because it's part frog, and frogs have long pink tongues and if it isn't what could it be? Also it appears that it wraps around its mouth. The only way to get it official is to ask Game Freak. Which I don't think is gonna happen very soon. Actually Greninja does open his mouth. In Pokemon Amie when he's eating Pokepuffs. I just noticed on Greninja's page that its base stat is only 520 whilst the others are 530. Why is that? Can Greninja's ability cure its own status problem? Why is greninja's stats at 520? Which of Greninja's types changes after it uses an attack (with protean ability)? Should I change Greninja's nature or not? Why can Accelgor learn Water Shuriken? I thought it was Greninjas signature move? How does ash’s greninja turn into ash-greninja without defeating an opponent in it’s regular forme at first?